Today Stock Rover presents two portfolios as part of what will become an ongoing strategy analysis series. In this article I will introduce the Large Cap Capital Appreciation Portfolio (LCCAP). Read about our other strategy, Dividend Growers, here. Both of these are available for download from our Investors’ Library. The LCCAP aims to outperform the S&P 500 using the Growth at a Reasonable Price (GARP) strategy while maintaining a risk profile similar to the benchmark. As per GARP strategy, the LCCAP will combine both value and growth investing strategies. Consequently, we hope to find stocks that both are undervalued and present significant growth potential. However, since value and growth investing have competing demands, not every stock in the portfolio will meet this criteria. Some stocks will be purely value picks while others will be entirely growth plays, but in the end, we hope the combination of these stocks will produce a GARP portfolio. 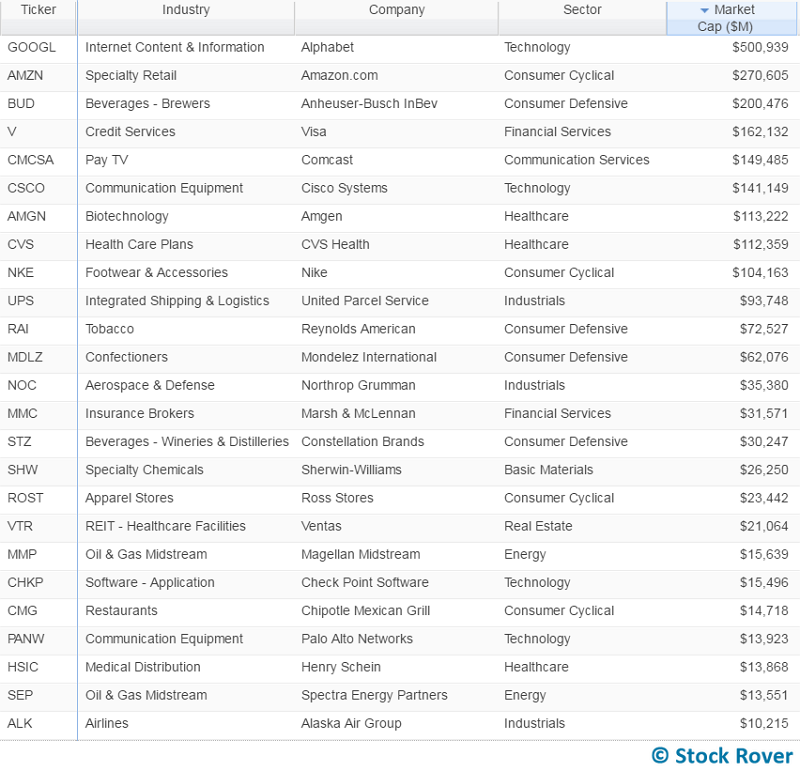 The 25 starting positions of the portfolio, ranked on market cap, are shown below. Although it would have been preferable to initiate our positions when we felt conditions were favorable for each stock, initiating all positions on the same day will make tracking the performance of portfolio easier. All individual positions are starting off at 4% of the overall position as shown below. This is a good starting percentage as it gives us a 2% drift in either direction. Additionally, the 2% drift we are starting with gives room to underweight or overweight positions depending on how reasonable an entry point is. Each position will be rebalanced when it falls below 2% or goes above 6%. 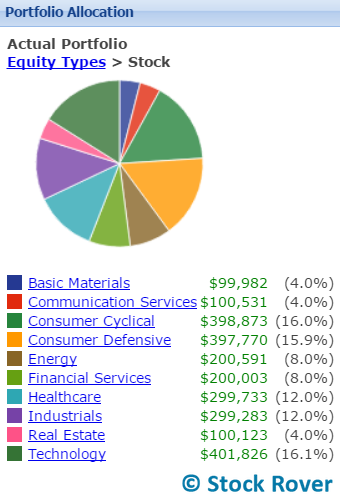 Staying true to our charter, no sector exceeds 30% of the overall portfolio as shown by the pie chart below. The portfolio is however heavily weighted towards the technology, consumer cyclical and consumer defensive sectors. No industry is more than 8% of the portfolio, with most being at 4%. All together there are 23 industries represented and the only overweight industries are midstream oil and gas and communication equipment. 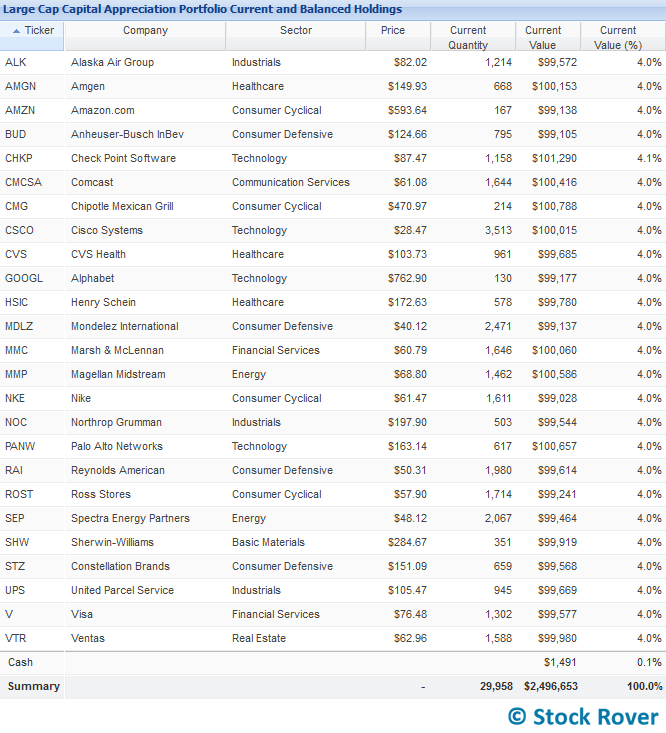 We’ll track all 25 stocks in the portfolio and update you when we make changes to positions. We’ll have a major review and rebalancing of the entire portfolio at the end of each quarter. Follow along (you can download the portfolio from library) and watch how this portfolio performs!